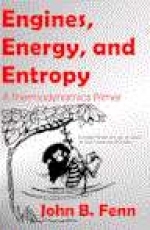 "Engines, Energy, and Entropy. A Thermodynamics Primer" by John B. Fenn (2003) ISBN 0-9660813-2. Paperback. In Engines, Energy, and Entropy, John Fenn engagingly explores the subject of thermodynamics by drawing on the reader's everyday experience. He lucidly explains the laws of thermodynamics, examines their origins, their meaning, and their application to familiar situations. His wry presentation includes frequent insights into the history of the subject, and a whimsical character named "Charlie the Caveman" as an early Everyman, highlighting the applications of the laws. End-of-chapter exercises permit readers to test their comprehension of the material.